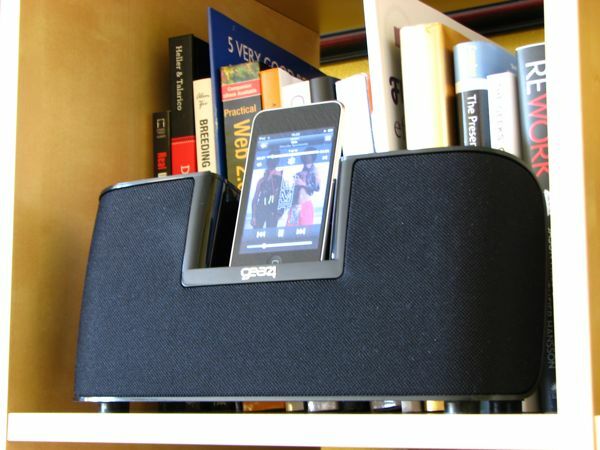 The Gear4 Explorer-SP is a compact speaker system certified for iPod and iPhone devices with a built-in Li-Ion battery with enough juice to power your tunes for up to eight hours and recharges in two. Although Gear4 has portability in mind for this dinky speaker, the Explorer-SP pumps out audio with adequate quality and volume to make it ideal for casual listening. Audio quality is surprisingly good for a speaker system of this stature. Bass reproduction is natural and not over-boosted. 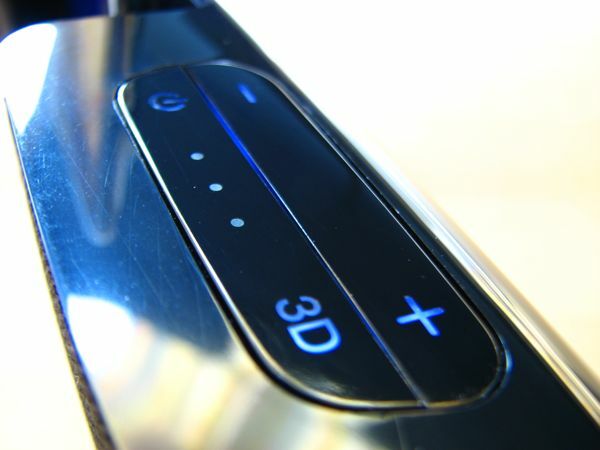 The 3D button makes a slight change to the equaliser settings, bringing treble levels up to give the audio a slightly clearer and crisper sound. Whilst I generally preferred to have 3D mode enabled, on tracks with heavy bass, there was a bit of distortion at the higher levels. But on the whole, sound quality is good with more volume than you can come to expect from a battery-powered speaker system. You can find volume, power and 3D stereo mode controls on the unit, with the rest being controlled by your iPhone-OS device. 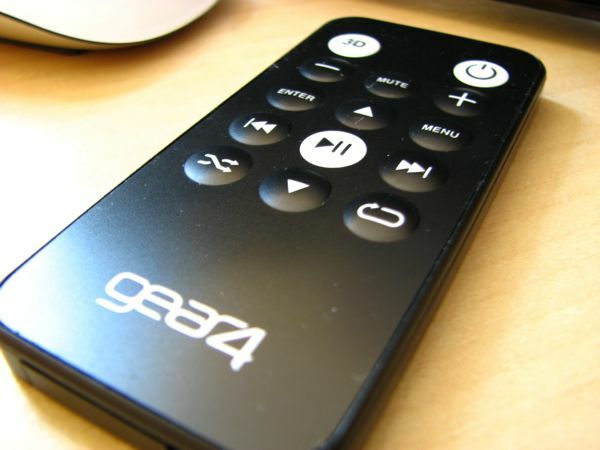 The infra-red remote gives you the same functions plus playback controls such as shuffle, repeat and navigation keys for moving around the device menus. Because the Explorer-SP is an Apple-certified device, you get the ‘as-expected’ remote control functions and on-screen playback functionality. This is evident when you use the volume slider on the device with instantaneous response – whereas on non-compliant accessories, the volume slider and menu keys don’t work properly. When operating the Explorer-SP away from the power mains, the recharging circuitry is deactivated to conserve battery life – so don’t expect to be able to use this as an emergency backup charger. A three-LED light indicator gives you a rough indication of remaining charge. Battery life holds true to Gear4’s claims, with the Explorer-SP managing 7.5 hours with charge remaining. Around the back there’s a small door held in with a screw which can be removed to reveal the ~2100 mAh Li-Ion battery. Doesn’t look like any battery I’ve seen before, but it seems to be user-serviceable providing you can get a hold of a replacement. A carrying case, mains adapter, remote, 3.5mm to 3.5mm audio cable, European adapter and a bunch of docking plates are included in the box – the essentials for any portable speaker system. Whether it was poor design or penny-pinching by the accountants, it’s clear that the carrying case is inadequate to protect this speaker from anything more than a slight bump. The padding is very thin, and the case is a tight fit for the speaker if you manage to get it in. One feature design aspect of the case I did like was the liner which protects the speaker from scratches by the zipper. The Explorer-SP carries a price-premium considering this isn’t a high-end speaker system and nor does it try to be. 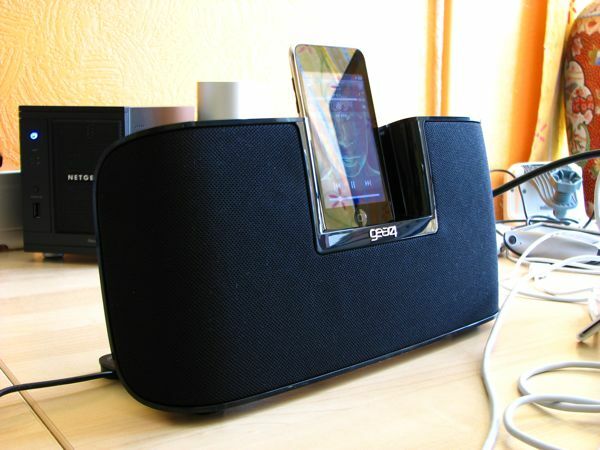 There are better sounding iPod/iPhone speaker docks on the market for the equivalent price. These of course won’t offer a rechargeable Li-Ion battery and the conveniences this adds to a number of scenarios. Audio quality and a decent set of kit that comes with it, makes the Explorer-SP an ideal travel companion that doubles up as a decent home speaker system that properly works with your iPhone-OS device. When I charge the I-pod the device is giving a biep al the time (not charging). I went back to the shop an got another one; same problem. Does anyove have an idee how to solve this? Somebody can help me: I have one Gear 4 Explorer SP but I lost the connection between the phone and the duck, the little plastic part. And now when I want to connect the IPod does’t work anymore. 🙁 Somebody know from were can I buy a new one?